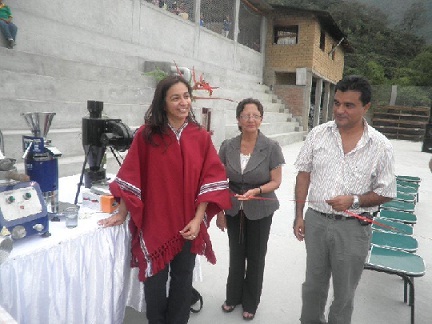 Peru’s Vice President Inaugurates a Coffee Processing Plant in Canchaque | Small Farmers. Big Change. More than 233 families from Coyona, in the Canchaque district of Huancabamba Province, have achieved one of their objectives. They have put into operation, the recently inaugurated Wet Processing Coffee Plant, which will enable them to process the coffee produced in this area of the Piuran zone of the Sierras. The project belongs to the “Jose Gabriel Condorcanque” Agrarian Coffee Cooperative in Coyona, an organization that forms part of the Piuran Organization of Small Coffee Growers (CEPICAFE). The project received 247 thousand soles in financing from Agroemprende, “but there was also a $37,900.00 contribution from Equal Exchange, which will be used to buy organic fertilizers. This is a great achievement for the cooperative, for its members and also for CEPICAFE” explained Santiago Paz, CEPICAFE’s co-manager. The processing plant includes a climate controlled area for the coffee, a quality control laboratory, and areas for equipment and other tool which will greatly help them to better meet the producers´ needs. The cooperative, presided over by Artemio Jimenez Huaman, has 233 members and approximately 323 hectares of coffee cultivation which annually produce 2 thousand one-hundred pound sacks of coffee. During the processing plant´s inauguration, the Vice President of the Republic, Marisol Espinoza Cruz, emphasized the producers´ unity and hard work, saying: “I reaffirm my commitment to continue supporting small farmers: coffee growers, cacao, banana and mango growers. You must keep moving forward, and with the support and backing from Congress and from the Vice President´s office, we are going to carry out this work together”. Also present at the plant´s inauguration were functionaries from Agroemprende and local mayors.